the Web and for download. Additionally, Parker Brothers has introduced several licensed variations on the game. While not as widely institutionally established as Scrabble, several clubs have been established for the purpose of organizing play and official Boggle clubs exist at a number of educational institutions. However, unlike Scrabble, there is no national or international governing or rule-making body for Boggle competition and no official tournament regulations exist. 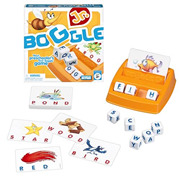 Boggle is a word game designed by Allan Turoff and trademarked by Parker Brothers / Hasbro, Inc. Numerous computer versions and variants of the game are available for play on the Web and for download. Additionally, Parker Brothers has introduced several licensed variations on the game. While not as widely institutionally established as Scrabble, several clubs have been established for the purpose of organizing play and official Boggle clubs exist at a number of educational institutions. However, unlike Scrabble, there is no national or international governing or rule-making body for Boggle competition and no official tournament regulations exist. This article uses material from the Wikipedia article "Boggle" and is licensed under the GNU Free Documentation License.